Here is another definition you may like to consider? False Evidence Appears Real. 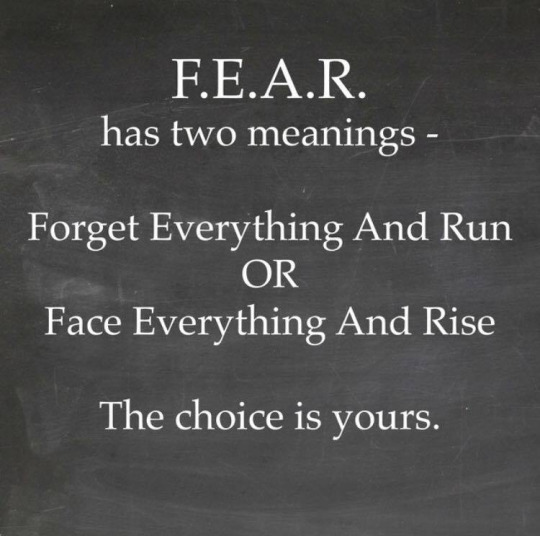 Face everything and rise? I disagree. Reach for the next good feeling thought and rise. From this higher place comes clarity that allows the ability to see the path. Facing and “dealing with” negative emotion is the last thing I would do. Get to that higher place and then the negative aspects can no longer affect you, they become irelevent. The sequence behind this, of course, is to pause, think, plan, solve, replace the false belief…and, yes, while in fear, the higher (thinking) mind is “hijacked” to some extent. As Tony Robbins says, we must 1st return to a higher state of resourcefulness – and like Einstein says “we cannot solve a problem at the same level of thinking in which we created it”. As Sam Carpenter says, we’ve got to bring back in our perfected “system” for solving the problem that comes up (and if the problem solving doesn’t work, we’ve got to correct our system, so that it does work). How well we set up the system (and how workable it is) is indicated by the results. If we have few problems, then we have set up a good problem solving system (I focus on that on my site, for incomplete systems most often do not work, of course).